Halo: Primordium is a military science fiction novel by Greg Bear, based on the Halo series of video games. The book was released in January 2012 and is the tenth Halo book (the ninth novel) and the middle book in the trilogy of novels focusing on the Forerunners, called The Forerunner Saga. Primordium was released in hardcover, e-book, and audiobook following 2011's Halo: Glasslands, the first book in the separate Kilo-Five trilogy. Primordium reached number seventeen on the New York Times Bestseller List in Hardcover Fiction. On July 19, 2011, Tor Books revealed the cover, title, and release date of the second book in the Forerunner Saga. On October 12, 2011 the book was completed and submitted to the publisher. On December 28, 2011 the first chapter of the book was made available on the publishers website and chapters 2, 3, and part of 4 were made available on the Halo Waypoint website. Video game website Kotaku was given a five-minute audio clip of the book being read by Tim Dadabo, who voiced the character of 343 Guilty Spark in previous Halo games. At a Comic-Con panel on the Halo Universe, Frank O'Connor stated that the book would have "resonant connections" with Halo 4. Bear stated that the interactions of the humans and the Forerunners were some of his favorite parts of the Forerunner trilogy. On April 12, 2013 Tor Books ran a promotion giving away the entire book trilogy to one participant. The books take place a hundred thousand years ago, during the fall of the Forerunner Empire and the invasion of the Flood. Two humans and Chakas are captives on an inverted planet and stuck in a dangerous game between the Forerunners and the Precursors. The story begins after the events of Halo 3 with the interrogation of a damaged monitor by ONI research team. The monitor was once, in human form, known as Chakas. Chakas starts telling them the story through flashbacks. Chakas starts the story from what happened after he, Born, Didact and Riser witnessed the testing of Halo on Charum Hakkor. Afterwards he and Riser were taken prisoner by The Master Builder and thrown on Halo Installation 07. Like every human, Chakas is also carrying a spirit within him given by The Librarian (Didact's wife). The spirit within Chakas is of Forthencho, who was once the human in charge of Charum Hakkor's defenses and had fought the Didact for years in the Human-Forerunner war. On Halo, Chakas befriends Vinnevra and her grandfather Gamelpar and the three of them proceed to follow Vinnevra's geas; seeking a safe place. Unbeknown to them, the installation’s beacon had been reset and they now head towards The Primordial’s lair - The Palace of Pain. They soon reach their destination and witness the Primordial guiding all the humans who had followed their geas to the Palace of Pain. After witnessing The Primordial, they decide to head in the opposite direction and after a long journey they reach the shores of an ocean. There they find a ruined city with Forerunner corpses and a Gravemind locked in a cell pleading for death and freedom. After crossing the ocean, the trio are found by a Lifeworker who accompanies them with several other humans and a giant ape named Mara. While sleeping at night in the refugee center, Chakas is greeted by Riser who warns him not to trust the Lifeworker. Later it is revealed everyone except the three of them are illusions cast by the monitors who are there to extract their spirits and store them as monitors. After breaking out of the illusion they are joined by Riser while Gamelpar dies due to old age. Forthencho converses with the spirit of Yprin Yprikushma within Riser who was responsible for excavating Precursor ruins and moving the Primordial to Charum Hakkor, which Forthencho has disapproved of. The group is finally brought to The Palace of Pain by a transport, where they are greeted by Mendicant Bias. The spirits within all humans are extracted and Mendicant Bias promises them revenge on Forerunners. Those who oppose are killed. Forthencho lies to Bias that Chakas has agreed to help them and they are transported to the Silent Cartographer. As Halo is on a collision course with a nearing planet they try to save it by interfacing Chakas through an infected Forerunner into Halo's system. A fleet led by the Didact then appears from the other side of the planet and the Didact purges Mendicant Bias from Installation 07. Chakas then merges with the Didact to move the halo through a portal. To do so, however, the halo must drop several pieces of itself, thus reducing its diameter to its current size. The Halo survives and Chakas and The Didact visit The Primordial, who has been imprisoned in a reverse time capsule (which speeds up time experienced within enclosure). He reveals that Precursors have decided Forerunners are not meant to inherit the Mantle (they have failed their test), but humans have been selected to be tested now instead; once Forerunners are eliminated, humans will be tested by Flood to check their worthiness for inheriting the Mantle. Didact then disintegrates the Primordial by turning the time dial to full and Chakas is converted into a monitor and is pleased to learn that his friends survived. The story ends with the now powered down monitor been ejected out into space, but not before a partial memory imprint of Chakas/monitor is transferred into the ship's computer. Shortly thereafter he takes control of the ship. It is then revealed that it was Chakas who was converted into 343 Guilty Spark. He is now seeking the spirits of Riser and Vinnevra, for whom he seek the Librarian.. He puts the ship's crew to sleep and takes off. Greg Bear is the author of Silentium and the two other Forerunner novels. At San Diego Comic-Con on July 14, 2012 Bear signed copies of the book. Halo: Primordium was on the New York Times Bestseller List: Hardcover Fiction for the week of January 7, 2012 at number seventeen. The Los Angeles Times had the book on its Bestseller List for two weeks, at number 16 and then at number 14 for the weeks of January 22 and January 29. Publishers Weekly listed the book at number seventeen on their Bestsellers Hardcover Fiction for the week of January 16, 2012. Story Hobby reviewed the book and gave it an 80% rating, calling the book a "big improvement" over the previous title, citing the exciting conclusion and more human centered story, but called the plot "weak". Book Loons called it "slow", and said it was only with those familiar with the source material, but that the audio book was very good, and that it had an excellent surprise ending. ^ a b "Tor Books Reveals Second Halo Novel by Greg Bear". Tor Books. July 19, 2011. Retrieved April 15, 2013. 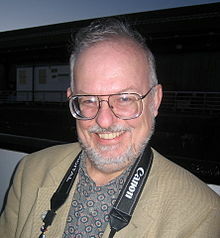 ^ Greg Bear (October 12, 2011). "News: Halo Primordium". Greg Bear.com. Archived from the original on April 6, 2013. Retrieved April 15, 2013. ^ "Halo: Primordium (Excerpt)". Tor Books. December 28, 2011. Retrieved April 15, 2013. ^ BS Angel (December 28, 2011). "THE HALO BULLETIN: 12.28.11, EXCLUSIVE BOOK EXCERPT - PRIMORDIUM". Halo Waypoint. Retrieved April 15, 2013. ^ Owen Good (February 3, 2012). "Hear Five Minutes of the Latest Halo Novel, Narrated by Guilty Spark". Kotaku. Retrieved April 15, 2013. ^ Matt Miller (August 29, 2011). "What's Coming In Halo 4?". Game Informer. Retrieved April 15, 2013. ^ BS Angel (March 6, 2013). "THE HALO BULLETIN: 3.6.13: An Interview with Greg Bear". Halo Waypoint. Retrieved April 15, 2013. ^ Louise Buckley (April 12, 2013). "HALO COMPETITION!". Tor Books Blog. Retrieved April 15, 2013. ^ "Tor Books at San Diego Comic Con. Scalzi, Sanderson, Card, and More!". Tor Books. July 5, 2012. Retrieved April 15, 2013. ^ "Best Sellers: Hardcover Fiction: Sunday, January 22nd 2012". New York Times. January 22, 2012. Retrieved April 15, 2013. ^ Liesl Bradner; Carolyn Kellogg; Michelle Minkoff. "Halo: Primordium by Greg Bear". Los Angeles Times. Retrieved April 15, 2013. ^ "Data for 01/16/2012 Bestsellers Hardcover Fiction". Publishers Weekly. December 28, 2011. Retrieved January 16, 2012. ^ Jason Hamilton. "Book Review: Halo, Primordium (2012)". Story Hobby.com. Archived from the original on February 18, 2013. Retrieved April 15, 2013. ^ Hilary Williamson. "Halo Primordium: The Forerunner Saga #2". Book Loons. Retrieved April 15, 2013. This page was last edited on 29 March 2018, at 02:21 (UTC).